This chapter presents the results of dynamical analysis of the equations and the set of equations with robust causal operator. The conditions for the local and global existence of solutions to the regularized equation are established, the estimate of the funnel containing a set of trajectories is given, and the stability conditions for a set of stationary solutions are found. In this case, the direct Lyapunov method and the principle of comparison with the matrix Lyapunov function are applied. 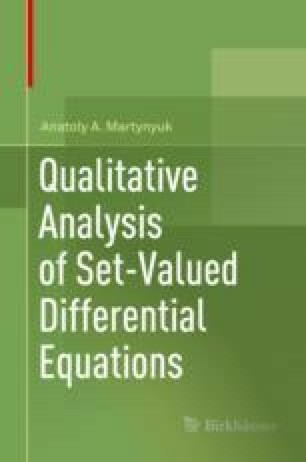 In this chapter the results of dynamic analysis of the family of equations with robust causal operator are presented. The conditions for the local and global existence of solutions to the regularized equation are established, the estimate of the funnel containing a set of trajectories is given, and the stability conditions for a set of stationary solutions are found. In this case, the direct Lyapunov method and the principle of comparison with the matrix Lyapunov function are applied.